In The Emigrant the author offers a re-reading of Heinrich von Kleist’s eight novellas, written between late 1805 and mid 1811, in which he unravels two covert threads of meaning woven, consistently across all eight texts, into the fabric of each of their overt stories: a political thread, termed “the satirical,” which entails Kleist’s critique of, and advise to, the key German political leaders of his day, in particular the Prussian King, regarding how to confront Napoleon’s expansionism, and a sensual one, termed “the satyrical,” in which Kleist traces what are likely his own, autobiographical, sexual experiences. 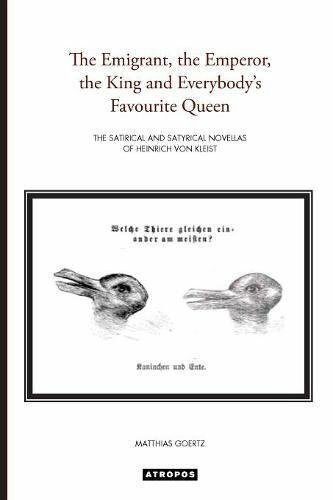 Not the overt stories, artful and entertaining as they may be, contain Kleist’s real concerns and messages to his audiences, but these covert threads he encoded into them do. The stories as they first present themselves to the reader merely comprise the transport vehicle and camouflage for the explosive material they contain (both the political and the sensual content would have been absolutely unpalatable to the authorities and the general public if expressed overtly; Kleist’s political statements, once decoded, have lèse-majesté written all over them, punishable by death). This re-reading demonstrates that Kleist’s texts cannot be properly understood in isolation, for only by uncovering Kleistian techniques and patterns in any one text and applying these findings to the others can the scope and consistency of these threads be established. Some of Kleist’s works (not primarily the novellas) have been termed “political,” and some of their passages “sensual,” but this re-reading shows that Kleist is a political writer par excellence, and a sensual writer tout court, every one of whose works (at least in so far as his novellas are concerned) is eminently political and sensual.